First picture: My brother Brody, Fr. Cash and I. Second picture myself and Fr. Baker. Happy Priesthood Sunday to all of the priests in my life, especially those who have impacted my vocation in such a large way. 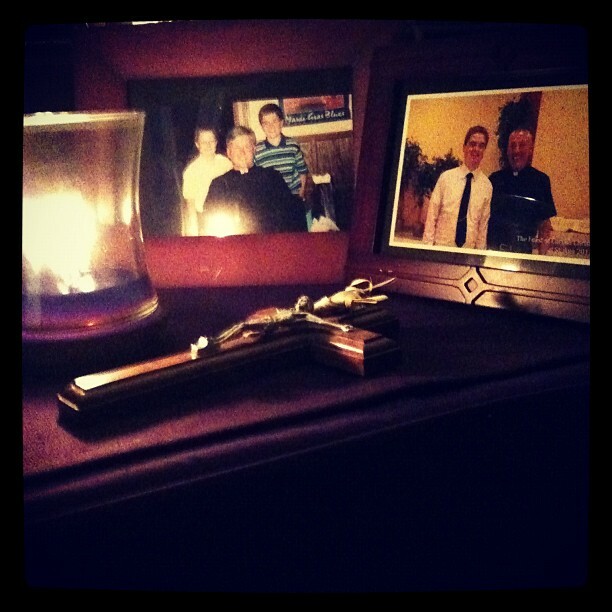 “The priest is present in all aspects of our lives. For it is the priest who welcomes the soul into the family of God through the saving waters of Baptism. It is the priest who absolves the sins of the person for the first time, opening to them the graces of God. It is the priest who nourishes the body with the body of our Lord, opening them to grace and igniting a love of our Eucharistic Lord in their heart. It is the priest who joins the person to another in the sacrament of matrimony, or assists them in pursuit of orders. It is the priest who finally anoints the body and prepares the soul for death. And it is the priest who welcomes the body into the church and commends the soul to God. The priest is present at every moment of our lives, in every aspect. Let us pray for our priests and thank them for their gift of their ministry and priesthood! To Fr. Richard Cash who first inspired me and planted the seeds of a vocation in my life, through his example of humility, love of Jesus, and sacrificial love, thank-you! I am blessed to call you a role-model and friend. You have been such an impact on not only mine, but my whole family’s lives. Thank-you for saying yes to God and the gift of your priesthood! To Fr. Gerald Baker, my former pastor, thank you for your wisdom, your joyful leadership, your model of faith and never shrinking away from sharing the truth and the Gospel of God. Thank-you for encouraging me to strive for holiness and your support in applying for seminary. I am blessed to call you a role-model and friend. You have and continue to be a great influence in my vocation and life. Thank-you for saying yes to God and for the gift of your priesthood!! There have been many other priests who have impacted my life in some way or another. Whether it be from their prayers, their model, wisdom, support, or bringing me the Sacraments, I am so thankful for the role that they have played in my life and their priesthood. Thank you also to those who have had and still do have a major hand in my seminary formation: Bishop William Medley, Fr. Andy Garner, Fr. Jason McClure, Fr. Bob Robeson, Fr. Patrick Beidelman, Fr. Tom Widner, Fr. Joseph Moriarty, & Fr. Jonathan Fassero. Thank you to all of the presbyterate of my Diocese of Owensboro! Without your support of vocations and our seminarians, I wouldn’t be where I am today. Thank you for your sacrifice and your paternal love and care! Thank-you to Bishop John J. McRaith who confirmed me, to those priests who I do not know their name, those who are no longer of this world, and those who have slipped my mind, thank-you for the gift of your priesthood and giving your life to serve all of the people of God! Fr. Bob brought up an interesting point in his homily today. We need to be supportive of priests, even if they do something that we disagree with, or they are not skilled in some area, they are still a priest , and thus deserve the same respect and love of any other one, even if they are not your favorite. Don’t try to pin them against each other, don’t compare them negatively. Just speak the truth and speak it with charity and trust. Respect your priests, pray for your priests, they are under attack in a sense more than any others. Satan hates priests, if Satan can turn people against the priest, or cause the priest to sin or commit a grave crime, and get the people to hate him because of it, not just that priest suffers, but all priests suffer. So , p;ease pray of them, respect them, love them, and encourage more of them! ← O Queen of the Holy Rosary! Well done Corey. Visit the the Shrine of Our Lady of Good Help sometime, Champion, WI, that’s where I am now. Thanks Father! Good to hear from you. I hope all is well! The shrine has been on my list of places to visit, ever since I heard about it from Fr. Jewel. I’m hoping to bring some of the men from Bruté up on a break sometime. Maybe we’ll see you at the March again this year?